I apologize in advance for letting everyone down. You may have looked at the slide show in advance and noticed that we didn’t take many pictures of Bangkok. It’s not that we were lazy. In fact we would have loved to have captured many images. We didn’t take many pictures because, well, we were pretty much stunned. You see, many moons ago Gage and I hatched this crazy plan to quit our jobs, sell all we own, and troop off to Thailand. Well a few natural catastrophes derailed our plans and we found ourselves in Europe for several months. While running around Europe was fun, arriving in Thailand was absolutely surreal. For more than a year we have been dreaming of this country. 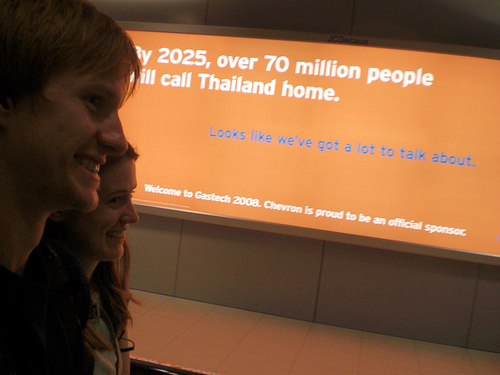 That dream was realized the moment we touched down in Bangkok. It didn’t matter to us that we didn’t have reservations at a hotel, a guide book, or even a map of the city. No, all that mattered was that we had arrived.